Servicing your boiler annually will prevent potential failures, ensure maximum central heating efficiency and keep your monthly bills to a minimum. By ensuring your boiler is regularly serviced you will prolong the life of your boiler and prevent more costly repairs in the future. For instance, leaks in your boiler can cause a breakdown that could put you out of hot water for a day or two. An annual boiler service will be able to identify and fix those leaks before they become an issue. Over time deposits build up within your boiler that reduce the efficiency of your boiler and increase your monthly bills. An annual boiler service will clear out those deposits and ensure that your boiler isn’t squandering any energy. This will reduce your monthly fuel bills and overall carbon footprint. Boiler failures can be fatal. Thousands of Canadians die or become ill each year due to Carbon Monoxide poisoning. If your boiler malfunctions, it could create a Carbon Monoxide leak. An annual boiler service will prevent malfunctions before they happen, keeping your home and family safe. Many boiler warranties and home & business insurances require that your boiler is safe to use. Having your boiler serviced annually will ensure that you meet most policy requirements – though it is best to check with your provider to be sure. Here at Butler Plumbing we have been servicing boilers since 2005 and have grown to become a leading plumbing and renovations company for Edmonton and its surrounding cities, having won the HomeStars ‘Best Of’ award every year since 2013. Click here to contact us now to get a boiler service quote. It is never an easy decision choosing someone to perform work within your home. You want someone that will be an expert on the work they are doing, work quickly and professionally, and above all be a friendly and conscientious person. 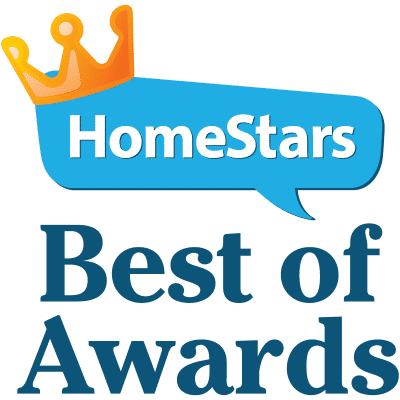 Having won the HomeStars ‘Best Of’ award every year since 2013 you can be assured that our professionals will have all three of those characteristics and provide you with the best service possible. Do you want the best plumbing company in Edmonton? Click here to contact us today to get one of our friendly professionals to conduct your boiler service. We service many boiler brands including: Allied Engineering, Burnham, Camus, IBC, Laars, Lochinvar, NTI NY Thermal Inc, Raypak, Rinnai, Super Hot, Veissman, Weil-Mclain, and much more. We also service and replace pumps and control brands such as: Armstrong, B&G, Danfoss, Fernox, Grundfos, Honeywell, HPS, Rehau, Taco, Tekmar, Uponor, Viega, Wilo, etc. The benefits of servicing your boiler are clear cut and neglecting to service your boiler can be devastating. Boilers that do not have an annual service are at risk of breaking down leaving you with very costly repairs, hot water shortages, and potential gas leakages. Fill out the form below to speak with one of our professionals today to get your boiler serviced sorted!